@JayJayasuriya: From Antichrist to Brother in Christ: How Protestant Pastors View the #Pope. From Antichrist to Brother in Christ: How Protestant Pastors View the #Pope. LifeWay Research finds Pope Francis has improved opinions of Catholic Church. More than one-third say they value the pope's view on theology, and 3 in 10 say he has improved their view of the Catholic Church. Those are among the findings of a new study of 1,000 Protestant senior pastors, released this week from Nashville-based LifeWay Research. Overall, the survey found that many Protestant pastors have taken a liking to Pope Francis. 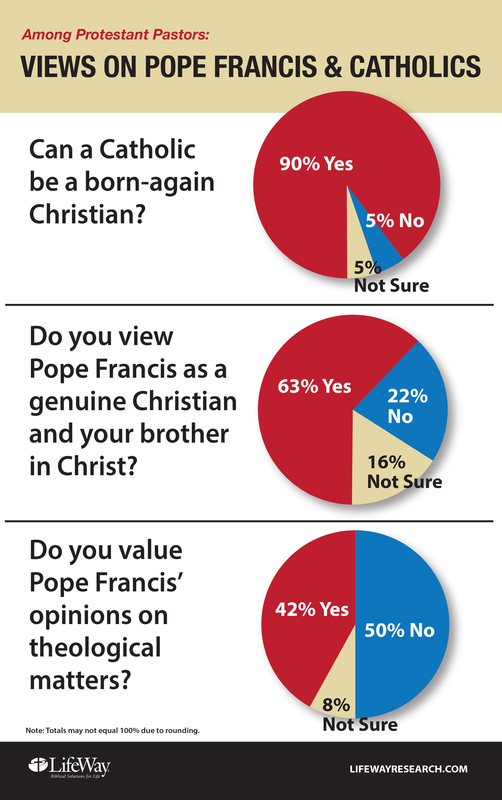 However, half of Protestant pastors say they do not value Pope Francis’ opinion on matters of theology. LifeWay asked 1,000 Protestant pastors in America about their views in a phone survey from September 8–21, 2015, shortly before the pontiff’s visit to the United States this week. Pope Francis, who in March 2013 became the first non-European and first Jesuit priest to be named pope, has been outspoken on such issues as welcoming immigrants, shunning materialism, and protecting the environment. For 43 percent of Protestant pastors, Pope Francis has not changed their views of the Catholic Church. However, half say the current pope has affected their opinions—and almost three times as many cite a positive impact (37%) as a negative one (14%).